For a clean install when using the “Mega Flames Setup”, instead of cutting your hard plastic fuel line in between the fuel tank and the fuel injector we have a solution. Our Harley Davidson EFI fuel line adapter makes this part of the install a snap. Literally! Unplug your fuel line from the fuel tank by using the quick disconnect and insert the fuel adapter in between the tank and the fuel line. 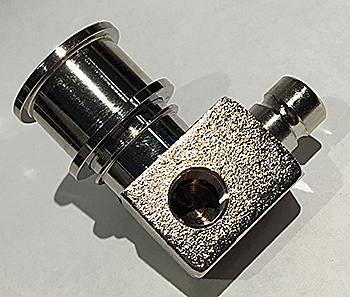 The fuel adapter has a 1/8 NPT female outlet that will accept a male NPT to AN fitting adapter. You can connect a braided stainless steel fuel line with AN fittings on each end in between the fuel adapter and the NOS solenoid. Mega Flames Plans: How to get 3-6 foot wild flames!